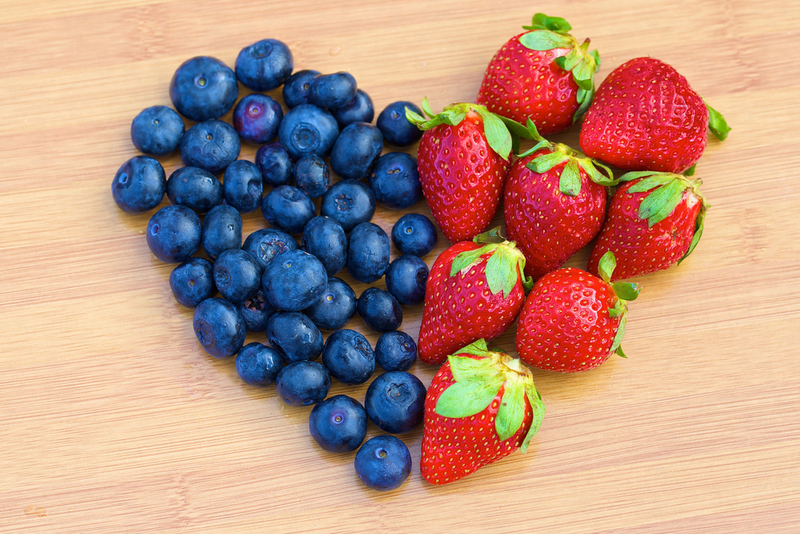 Cholesterol – it’s all about balance. With the focus for many people being on heart health this month, it’s a great time to think about the amazing muscle in our chest that beats around 70 times a minute, all day every day. As with all of the body’s precious organs, it needs to be well taken care of and having high cholesterol levels is a known risk factor for heart disease. Clinical nutritionist, Suzie Sawyer, shares her five top tips for keeping cholesterol levels well balanced. Before we begin, there are two types of cholesterol. HDL (High Density Lipoprotein) known as ‘good’ cholesterol, helps remove other forms of cholesterol from the body. Higher levels of HDL offers some protection against heart disease. LDL (low Density Lipoprotein) is otherwise known as ‘bad’ cholesterol and is associated with heart disease and other circulatory disorders as it collects in the walls of blood vessels and can cause blockages. So what can we do to encourage the good and get rid of bad? The essential omegas, in particular the omega-3s, can help reduce cholesterol levels and also have other heart-loving benefits. 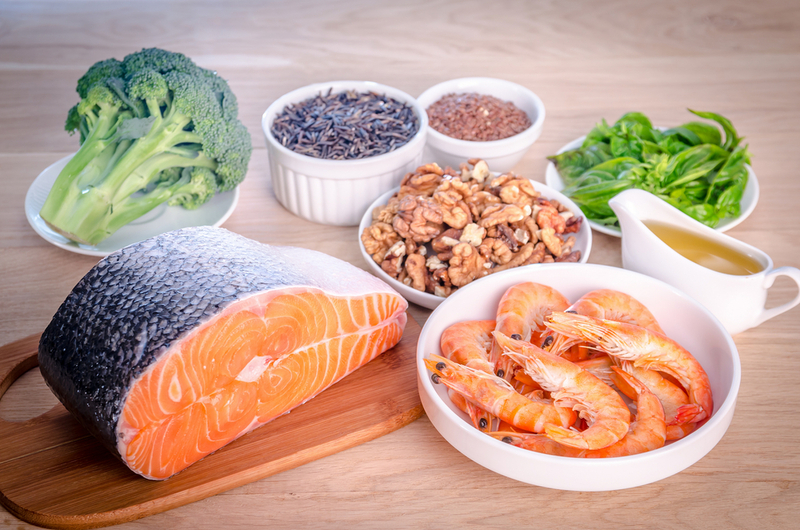 The body cannot make them so they have to be eaten very regularly in the diet; the best sources are oily fish (salmon, mackerel, sardines) and nuts and seeds (pumpkin seeds and walnuts are best). Omega-3s can help to reduce levels of LDL cholesterol. Omega’3s are also needed to manage inflammation throughout the body, and have other beneficial effects on blood pressure and heart health generally. Try to eat oily fish two to three times a week; vegetarians should try to eat nuts and seeds every day (try flaxseeds which contain the essential Omega-3s). However, if that’s not for you or not doable, do opt for an Omega-3 supplement every day. Trans fats (mainly found in margarines) are chemically produced and have an adverse effect on the heart (and health generally). The problem with trans fats is that their chemical structure changes when the fats are heated and processed. Food manufacturers frequently use the process of hydrogenation, which produces trans fats, in order to increase shelf life of foods such as margarines, biscuits and cakes. Unfortunately, the body has no way of dealing with them, therefore they tend to elevate blood fat levels, and in turn raise cholesterol levels. Trans fats have no health or body benefits, therefore it’s best to try to avoid them as much as possible. It is actually better to have a little butter rather than using margarine, but also try using olive oil, coconut oil or rapeseed oil for cooking and keep cakes and biscuits to a minimum. Your waistline, as well as your heart, will certainly thank you! There are always many good reasons for eating plenty of apples, plus they’re in season right now so their nutritional value should be higher, and they might even be a little cheaper. 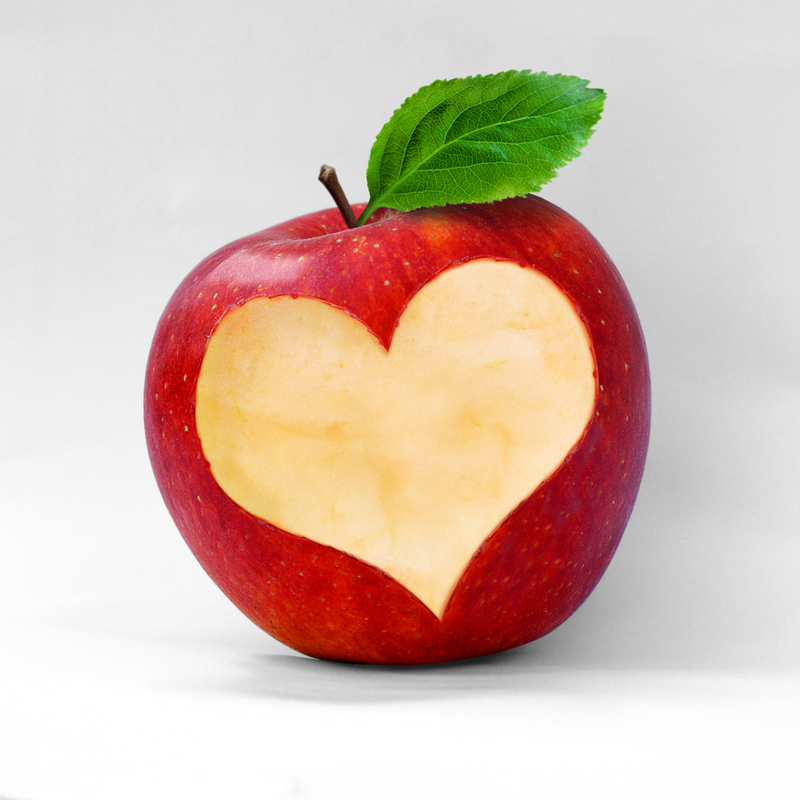 Apples contain a particular fibre called pectin, which helps to reduce cholesterol levels by transporting the bad cholesterol out of the body. Other fruits high in pectin include pears, all berries and citrus fruits. The best advice is to include a wide range of fruits (alongside vegetables of course) every day. Cholesterol has no way of being expelled from the body except through the stool. Therefore keeping the bowels regular is key and, as pectin is a fibre, it really helps this process along. Having a high fibre diet generally is one of the best ways of keeping cholesterol levels balanced. 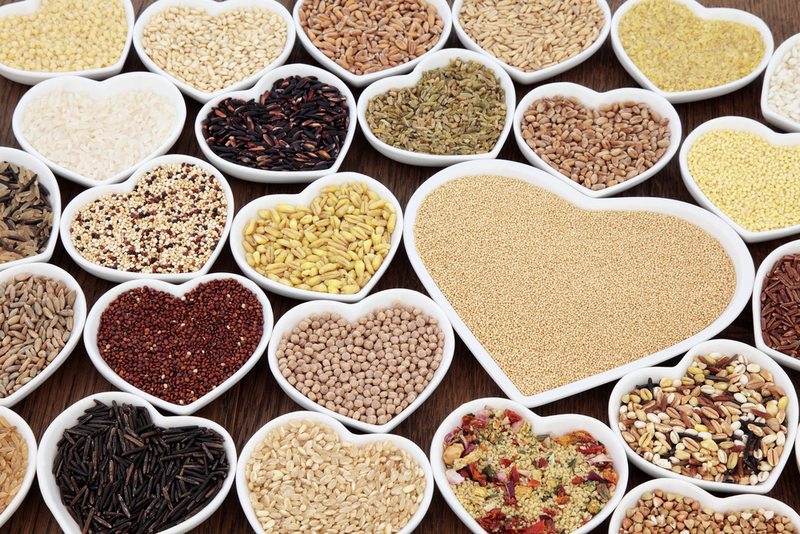 Wholegrain foods such as whole wheat bread and pasta, rice, quinoa, oats, beans and lentils are naturally high in fibre. In contrast, refined (or white) foods have had the fibrous part stripped out, so play no role in a high fibre diet. It’s actually quite easy to increase the amount of fibre in the diet without too much effort. For example, porridge sprinkled with a few flaxseeds makes a great breakfast, especially now the colder weather has arrived. Try a brown bread sandwich for lunch, alongside an apple (or berries) plus some nuts and seeds for snacks during the day. Salmon, quinoa and plenty of veg for dinner ticks both the fibre and Omega-3 boxes. A diet generally high in saturated fats, found mainly in dairy produce and red meat, is certainly going to encourage the production of cholesterol. Switch to skimmed milk as a starter. However, there’s some research to suggest that soya produce, including milk, may help reduce the ‘bad’ cholesterol. Plus, nut milks such as hazelnut, almond and oat, may also have a beneficial effect. At the very least, they’re all low in saturated fats. 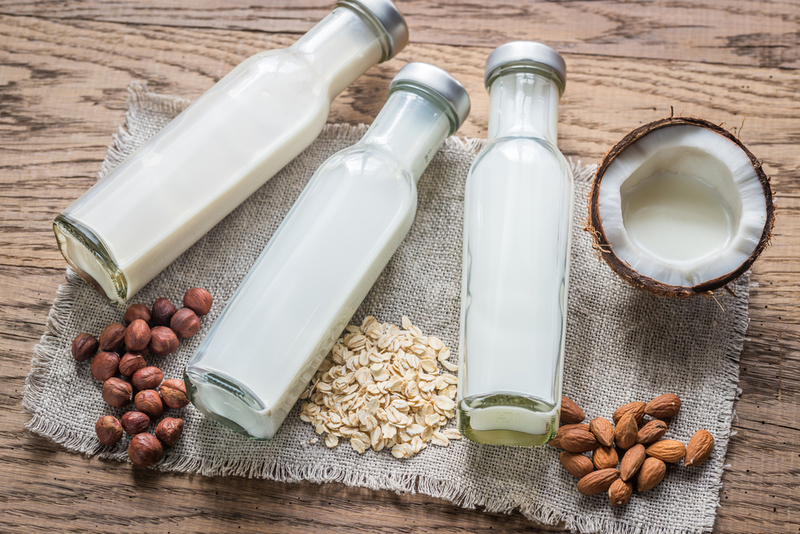 Even if you’re a die-hard cow’s milk fan, try to include some other milks in the diet as much as possible: each type of milk has its own health benefits so change them up as much as possible. So adopt a few simple dietary changes and you can improve your cholesterol levels and support a healthier heart longer term.